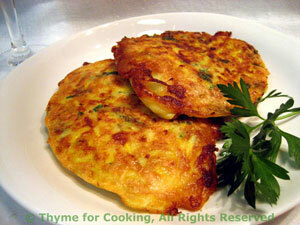 Zucchini or Courgette Patties, Thyme for Cooking summer vegetable sides. Up until 6 years ago I had never eaten a zucchini. It started with my neighbor dropping them off... Then I planted them... This was one of my first recipes and still a favorite. If you don't have bread crumbs, take a rolling pin over 2 - 3 plain crackers (put the crackers in a plastic bag). Do not grate the zucchini in advance. Shred zucchini using large holes on box shredder or food processor. In medium bowl lightly beat egg, add bread crumbs, Parmesan, salt and pepper. Mix well. Add zucchini, chives and mix well. Divide mixture into 4ths and spoon each 4th into pan, shaping into patty and patting down lightly. Sauté 5 - 10 minutes, or until brown, then turn and fry other side the same. When brown, remove and serve. A little freshly ground pepper and sea salt on top is a nice touch.